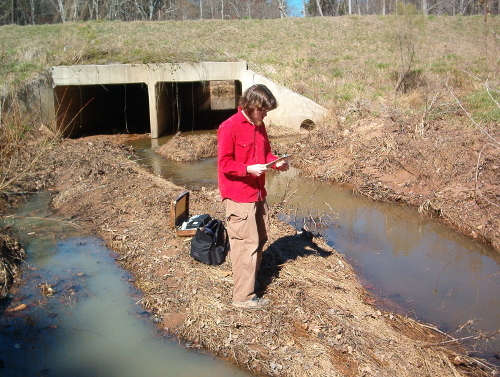 One of the big contributions that people can make to improving the Northeast Creek basin and watershed is monitoring the physical quality of the water and the proper functioning of water, stormwater, and sanitary sewer utilities and reporting issues to the county water, stormwater, and sanitary sewer staff. Being conscious of the appearance and smell of the streams in the watershed is the first step to having intensive monitoring of environmental quality. Observe how water runs off the roof of your residence and trace where it goes. Does it flow into a storm drain, down a slope, or fairly quickly into a creek? Where does the storm drain or slope or creek go? Use your country GIS system to follow which streams the water from your roof flows along and where it ultimately goes. (If you are in the Northeast Creek watershed, it ultimately goes into Lake Jordan at the NC 751 bridge. From there, it flows through the spillway of the Lake Jordan Dam and into the Haw River, which merges with the Deep River to form the Cape Fear River. The Cape Fear River empties into the Atlantic Ocean southeast of Wilmington by Bald Head Island (Cape Fear). Pay attention to any drainage problems that you have. The longer water stands and soaks on your property here in the headwaters regions of major rivers, the more it gets conserved here. If it runs off too fast, it can cause erosion that can cause people downstream from you to lose topsoil and also parts of their yards from erosional scour. Look at the types of plants and where they are located relative to the drainage. Are they plants that rapidly evapo-transpire water or slowly evapo-transpire water? Where are the areas in your yard where water can soak in and replenish the groundwater without creating standing water? A drainage basin is the largest catchment for rainwater. Your local catchment is the simplest. It is a single creek segment between branches and the headwater slopes that drain into that segment at a single point. Use your county GIS to discover the ridges that define your catchment, and go with neighbors to look at the condition of the catchment and its slopes in the same way that you looked at your yard. What affects the speed with which the water drains and the stream quality? Are there particular areas that tend to collect litter? Are there illegal dumping spots for appliances or tires or other bulk items? What are the attractive places that you as a community would like preserved in your local catchment? Where could you work as a community to improve the water retention, water flow, or water quality in your local catchment? Involve your neighbors in regular monitoring of your local catchment over the year and from year to year, noting any changes in stream flow, stream quality, vegetation, or wildlife. Volunteer monitors can regularly observe the condition of these streams outside of residential neighborhoods and report it to your city or county stormwater services department. Northeast Creek Streamwatch has been regularly monitoring stream quality at the Grandale Drive bridge, Sedwick Road bridge, Sohi Road bridge, and Ellis Road bridge for eight years. Monitoring dates will be posted on the Events Calendar.